Goblins might work together some of the time, but they're just as ready to attack one-another as they are humans or elves or dwarves or such. They're also rather sneaky, so you've gotta watch your back against surprise attacks. Keep your wits about you and you might just survive Goblins: Ready Set Destroy, a new card game that's up on Kickstarter now. 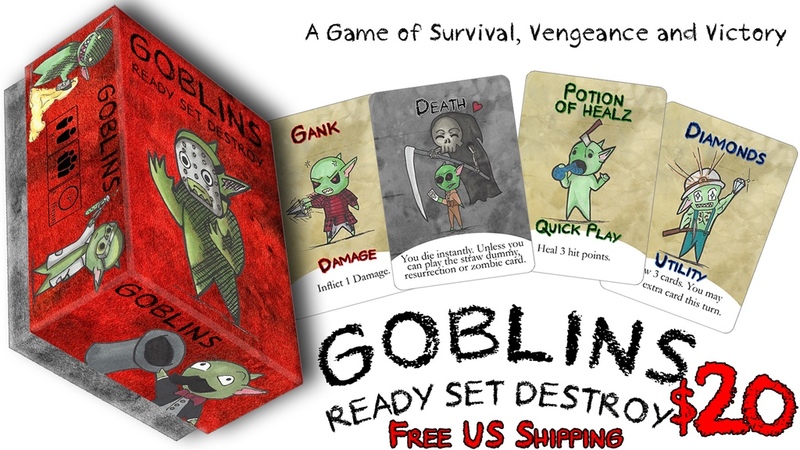 Goblins: Ready Set Destroy is a fast-paced card game for 2-4 players, or 2-6 players using a second deck. In this game players have two goals: destroy your enemies’ hit points, and avoid death at all cost. Players will use Damage cards to reduce other players hit points, Utility cards to create strategic game play and make each game unpredictable and Quick Play cards to heal, reduce damage, or bounce damage around. Beware - not only are your opponents out to get you, there is also Death card hidden in the draw pile ready to strike you down at any time. With countless possible combos and strategies, every game will be different! This game is fun and replayable! The Kickstarter campaign's roughly 1/3 of the way to its goal with still 28 days on the clock.